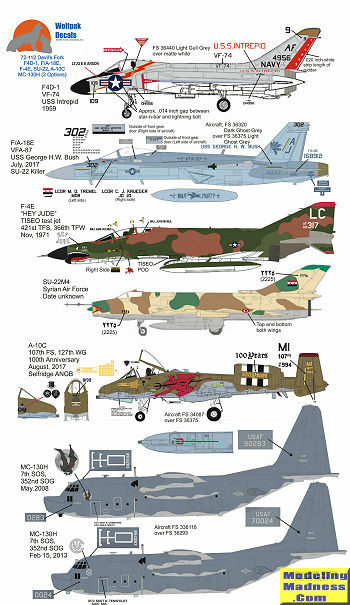 This sheet has another nice selection of \ aircraft ranging from the late 1950s until today. There are seven aircraft from six different units. They include a special scheme plane and a 'furriner'. First option is an F4D-1 Skyray from VF-74 aboard the USS Intrepid in 1974. The Skyray had a short operational life, but was a great interceptor. Next, from July 2017 is the latest air to air victor, an F-18E from VFA-87. This aircraft was aboard the USS George W. Bush and shot down a Syrian Su-22. From the Vietnam war is a relatively well known F-4E, 'Hey Jude'. This 421st TFS aircraft is from 1971 and in the usual SEA camo scheme. Why not add an Su-22 to the mix? Here is a Syrian Air Force Su-22M4. This may or may not have been the plane shot down (probably not, but who knows?). Our special scheme plane is an A-10C from the 107 FS, Michigan ANG in August of 2017. It is painted up in a pseudo-WWII scheme to celebrate the unit's 100th Anniversary. Finally, a pair of MC-130Hs. Both from the 7th SOS. One from 2008 and the other from 2013. There are good kits for all of these options so finding one that works for you will not be an issue. Some of these will require upgrade sets and that information is provided. 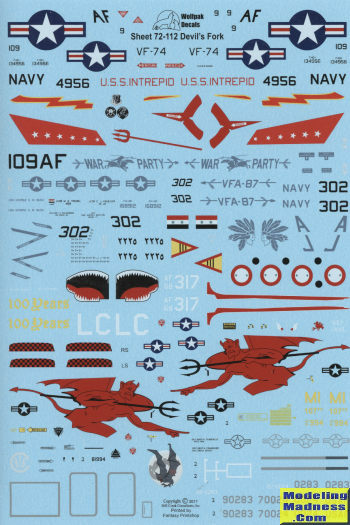 The decals are superbly printed by Fantasy Printshop. The sheet's outstanding instructions provides complete drawings of all these schemes to ensure that you will be able to duplicate them.